Posting on social media is not what we are referring to when we say it is beneficial to record your boxing workouts. That doesn’t mean you shouldn’t, but your social media engagement is your business. Helping build better boxers is ours. Why should you record your boxing workouts? Everyone has a certain style and method of movement. Some of these idiosyncrasies are good, but others are not. Most coaches serve the purpose of correcting the movements that are not ideal, but sometimes you have to see it for yourself. Let’s say you think that you are keeping your hands up at the level of your face, but your coach is repeatedly telling you to keep your hands up. It may take visualization of the problem that inspires the need to fix it. 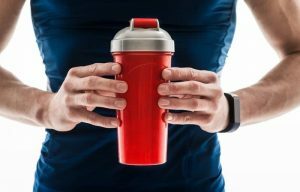 It may sound silly to record yourself lifting weights or doing pushups, but a sloppy workout can have an impact on the functionality of your muscles. Reviewing your posture and technique can identify areas where you are weak or unintentionally causing damage to your body. 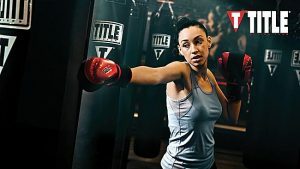 This is a great way to make the most out of your boxing workouts. Sparring while trying to watch yourself probably won’t work out well. But shadowboxing in front of a mirror allows you to see your movements and correct them in real time. If you have the opportunity to shadow box with a group of people, a mirror allows you to mimic their movements and see what works for you. Having the ability to correct your movements while you are training can be very valuable. At times you may find that you are having difficulty understanding exactly what you need to do in a particular drill. In a small class situation, it may be beneficial for the trainer to video boxing workouts done by you and the others in the class. If you can watch the video in between rounds it may be easier to understand the parts you are missing in comparison to your teammates. Sparring is when it all comes together. All of the techniques learned in class are applied and you realize what it is that actually works for you and fits with your natural reactions. Recording sparring can be crucial to identifying holes in your technique and especially important for competitive boxers. Push-ups are a foundation exercise for many athletic training regiments. Boxing is no exception. There are numerous ways push-ups can increase athletic performance with an emphasis on increasing power and endurance. Boxers have been known to throw 150 punches a round. That is a high end, but it can happen. Regardless, being prepared to throw large volume is important. Push-ups work the chest, shoulders, and triceps, which are the same areas that are used to throw punches in boxing. Being able to execute push-ups at a high volume trains the relevant muscles to work for extended periods without fatigue. Doing multiple sets of push-ups throughout a training session will help build this type of endurance. 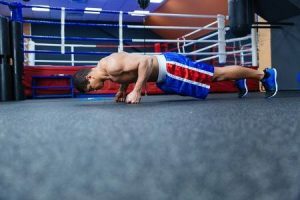 Using plyometric push-up techniques is one way to improve explosive power necessary for boxing. With any plyometric workout, the exercises should be limited to what can be achieved accurately. 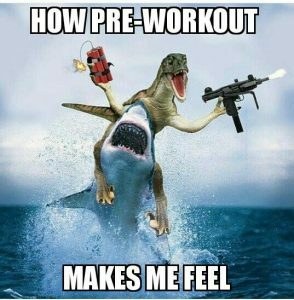 Most movements are unorthodox and taxing on the muscles, thus more difficult to maintain proper form for long sets when first starting. One of the best ways to train explosively is using clap push-ups. These are executed by pushing up hard through the hands so that they propel the body high enough off of the ground that you can clap in between pushes. If these are difficult in the beginning, it is recommended to start on the knees. It is not necessary for feet or knees to come off of the ground. There are many variations to using a medicine ball with your push-ups. For this one, start with one hand on the ground and the other on a small medicine ball. Without letting the ball move, explode up and over to the other side, having your opposite hand land on the medicine ball. Be sure to “catch” yourself without hitting the ground and keep the ball in the middle as you go from side to side. A set of 5 to each side is a good starting goal. 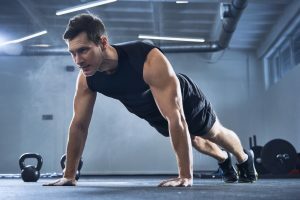 According to a 2015 study in the International Journal of Sports Physical Therapy, the quality of your explosive push-ups should determine when you end your set. If you start to feel significantly slower or your form starts to break down, you should stop. Explosive push-ups should be executed as fast as possible. For explosive push-ups, this means that you may need to limit your sets to 3 -4 sets with no more than 10 reps each. Standard push up can typically have longer sets depending on where you are in your fitness journey. Push-ups can be frequently incorporated into workouts, but it is necessary to give the muscles a break. Listen to your body to tell you when it is too much. Having a strong core is crucial for boxers and also aesthetically pleasing. The concept of completing 1000 crunches a day is helpful, but not the best way to achieve visual results. The appearance of abs heavily dependent upon body fat percentage. The lower the body fat, the more evident the abs. This is why even people who are undernourished may have evidence of abs without the gym time. This does not mean that abdominal exercises are not important for core strength. They are very much so, but this also involves targeting different areas of the core to promote stability rather than focusing on the short movement of crunches. Essentially, six packs are made in the kitchen. It sounds like a good idea. Adding weight to your punches should make them faster and make you stronger. Unfortunately, the torque and strain that the extra weight places on the shoulders and lumbar spine have been known to result in injury. There are a number of other strength and speed building exercises that have been shown to produce results with significantly less risk. Boxing fitness can already be painful enough. Don’t make it worse by unnecessarily wearing down your joints and tendons. Roadwork is the cardio based effort that is put in to complement training in a specific sport. Many people are under the assumption that the more miles you run, the better your conditioning will be. Though endurance training is helpful, it is not the end all be all. Energy systems used for boxing are primarily anaerobic, comprised of short bursts 70 to 80 percent of the time. This means that high-intensity training is crucial for effective boxing fitness roadwork. Some athletes are naturally gifted with muscular genetics. 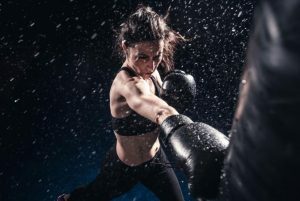 Fighters like Mike Tyson may not need to hit the weight room because their power and physique do not require that specific training, but for the vast majority of athletes, weight training provides a significant advantage. If two fighters have the same skill level and one is stronger, the stronger has a higher chance of victory. Weight lifting will not hinder speed unless the fighter does not train speed and flexibility. Technique is key for improving punching power. That is all there is to it. You can stand in front of a heavy bag and throw everything you have at it, but unless you are using proper technique, your power will not increase. It sounds like a good idea. Adding weight to your punches should make them faster and make you stronger. Unfortunately, this is a boxing training myth. The torque and strain that the extra weight places on the shoulders and lumbar spine have been known to result in injury. There are a number of other strength and speed building exercises that have been shown to produce results with significantly less risk. Boxing can already be painful enough. Don’t make it worse by unnecessarily wearing down your joints and tendons. Roadwork is the cardio based effort that is put in to complement training in a specific sport. Many people are under the assumption that the more miles you run, the better your conditioning will be. Though endurance training is helpful, it is not the end all be all. Energy systems used for boxing are primarily anaerobic, comprised of short bursts 70 to 80 percent of the time. This means that high intensity training is crucial for affective roadwork. Some athletes are naturally gifted with muscular genetics. Fighters like Mike Tyson may not need to hit the weight room because their power and physique does not require that specific training, but for the vast majority of athletes, weight training provides a significant advantage. If two fighters have the same skill level and one is stronger, the stronger has a higher chance of victory. Weight lifting will not hinder speed unless the fighter does not train speed and flexibility. Building power from just hitting stuff hard is a boxing training myth. Technique is key for improving punching power. That is all there is to it. You can stand in front of a heavy bag and throw everything you have at it, but unless you are using proper technique, your power will not increase.